Silver nanoparticles made by green synthesis have been incorporated into pectin-based copolymer gel to make a nanocomposite gel to be used as an adsorbent material for the removal of divalent metal ions and dyes from aqueous solutions. Silver nanoparticles were obtained by mixing silver nitrate with aqueous solution of pectin followed by microwave irradiation. 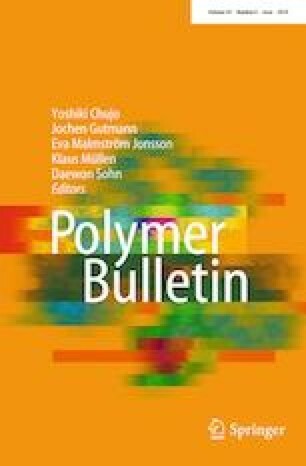 The nanocomposite hydrogel was obtained by the microwave-assisted polymerization of 2-acrylamido-2-methyl-1-propanesulfonic acid (AMPS) and acrylamide (AAm) in the presence of N,N’-methylene-bis-acrylamide (MBA) in pectin solution containing silver particles. Characterization of the nanocomposite gel was done by FTIR, TGA, XRD, FESEM and EDS techniques. The system was evaluated for its capacity to adsorb cationic dye, crystal violet (CV) and metal ions [Cu(II) and Pb(II)] from aqueous solutions. The presence of Ag nanoparticles is observed to enhance the adsorption capacity of the gel for the above mentioned adsorbates. The kinetic studies revealed second-order adsorption processes which fit well into Langmuir model. The evaluation of thermodynamic parameters indicated the adsorption process to be exothermic and spontaneous. A maximum of 1950 mg/g CV, 111 mg/g Cu(II) and 130 mg/g Pb(II) could be removed from the aqueous solution which is quite high in comparison with other reported materials. The desorption studies indicated the possible reusability of the nanocomposite.